Though it does not make into Bengali’s fancy cuisine list, Teel-Kochu is a simple and tasty dish made with taro-stalks and sesame seeds. Kochu, which is arum in English but more commonly known as Taro is a prized vegetable in Hawaii and countries like Philippines and university research has been conducted for better cultivation procedures. It is still considered a common man’s food in Bengal region. 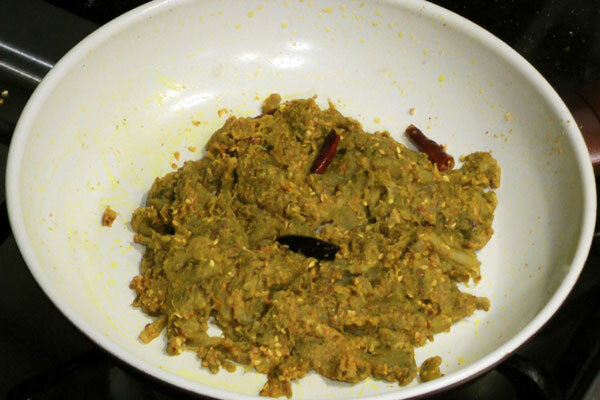 But the recipe is simple and straightforward, healthy and unique and most of all Teel-Kochu is tasty. After thoroughly washing the taro stems, cut them into 6 to 8 inch long pieces. Remove the skin from the stalks and further cut those into 1 inch long pieces. Steam those in a regular container or in a pressure cooker, drain the water and press out as much water as possible. Roast the sesame seeds by spreading them on a hot skillet and stirring gently making sure that the seeds don’t burn. Continue roasting the seeds till they turn deep brown and then grind coarsely. Set that aside. Heat the sesame oil and add the dry red pepper and the steamed kochu. Then add turmeric powder, salt and ground sesame seeds. Mix uniformly and turn off the flame. Continue mixing till the desired consistency is achieved.